The purpose of the study is to determine the communicative approach used by pre-service teachers in science teaching. For this purpose, 7-week instructional program was developed and applied to raise the pre-service teachers’ awareness of dialogic teaching and communicative approach. Before and after this instructional program, one lesson of each pre-service teacher was video-recorded. These videos were analyzed on the basis of four classes of communicative approach developed by Mortimer and Scott (2003). In line with the purpose of the study, the discourse analysis method was employed to determine the communicative approach used by the pre-service teachers. For this discourse analysis, the lessons of the pre-service teachers were used as sample cases. Moreover, the pre-service teachers were asked to watch their lessons video-recorded before and after the implementation of the instructional program and to write which communicative approach they used in these lessons and why they used this approach. 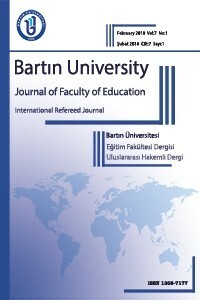 The findings of the current study revealed that the pre-service teachers mostly preferred the authoritative approach before the instructional program; yet, after the instructional program, besides the authoritative approach, they started to use dialogic interaction-based communicative approach in their lessons. Their reasons for using this communicative approach were also elicited. Bu çalışmanın amacı, fen bilgisi öğretmen adaylarının fen öğretiminde kullandıkları iletişimsel yaklaşımın belirlenmesidir. Bu amaçla, öğretmen adaylarına diyalojik öğretim ve iletişimsel yaklaşıma yönelik farkındalık oluşturmak için 7 hafta süren bir eğitim programı geliştirilmiş ve uygulanmıştır. Eğitim öncesi ve sonrası öğretmenlerin birer dersleri videoya kaydedilmiştir. Öğretmen adaylarının ders videoları Mortimer ve Scott (2003) tarafından geliştirilen iletişimsel yaklaşımın sınıflarına göre analiz edilmiştir. Araştırmanın amacı doğrusunda öğretmen adaylarının kullandıkları iletişimsel yaklaşımı belirlemek için söylem analizi yöntemi kullanılmıştır. Söylem analizi için ise, öğretmen adaylarının dersleri örnek olaylar olarak kullanılmıştır. Ayrıca öğretmen adaylarından eğitim öncesi ve sonrası derslerini izlemeleri ve kendilerine göre derslerinde sıklıkla kullandıkları iletişimsel yaklaşımı ve bu iletişimsel yaklaşımı kullanma gerekçelerini yazmaları istenmiştir. Araştırmanın bulgularına göre, çalışmaya katılan öğretmen adaylarının eğitimden önce sıklıkla otoriter yaklaşımları tercih ettikleri, eğitimden sonra ise otoriter yaklaşımların yanında diyalojik etkileşimli iletişimsel yaklaşımı da derslerinde kullanmaya başladıkları tespit edilmiş ve kullanmalarındaki gerekçeler ortaya çıkarılmıştır. Akış, A. (2012). Otoriter ve diyalojik öğretmenlerin öğretmen-öğrenci rollerine dair beklenti ve inançları. Yayınlanmamış Yüksek Lisans Tezi, Gaziantep Üniversitesi Sosyal Bilimler Enstitüsü, Gaziantep, Türkiye. Akpınar, E. & Ergin, Ö. (2005). Yapılandırmacı kuramda fen öğretmeninin rolü. İlköğretim Online, 4 (2), 54-65. Alexander, R. (2006). Towards dialogic teaching (3 th Ed), York: Dialogos. Baş, T. & Akturan, U. (2008). Nitel araştırma yöntemleri. NVivo 7.0 ile nitel veri analizi. (Birinci Baskı), Seçkin Yanyıncılık, Ankara. Chin, C. (2006). Classroom interaction in science: Teacher questioning and feedback to students’ responses. International Journal of Science Education, 28 (11), 1315–1346. Erdogan, I. & Campbell, T. (2008). Teacher questioning and interaction patterns. International Journal of Science Education, 30 (14), 1891-1914. Game, A. & Metcalfe, A. (2009). Dialogue and team teaching. Higher Education Research & Development, 28 (1), 45-57. Hackling, M., Smith, P., & Murcia, K. (2010). Talking science: Developing a discourse of inquiry. Teaching Science, 56 (1),17-22. Hardman, F. & Abd-Kadir, J. (2010). Classroom discourse: Towards a dialogic pedagogy. In D. Wyse, R. Andrews & J. Hoffman (eds.). The International Handbook of English, Language and Literacy, pp. 254-264) Routledge, Taylor and Francis, London. Kanadlı, S. (2012). Öğretmenlere yönelik hazırlanan bir mesleki gelişim programının etkililiğinin incelenmesi. Yayınlanmamış doktora tezi. Gaziantep Üniversitesi Sosyal Bilimler Enstitüsü, Gaziantep, Türkiye. Koufetta-Menicou, C. & Scaife, J. (2000). Teachers’ questions-types and significance in science education. School Science Review, 81 (296), 79-84. Lehesvuori, S. (2013). Towards dialogic teaching in science: Challenging classroom realities through teacher education. University of Jyväskylä, Jyväskylä. Löfgren, R., Schoultz, J., Hultman, G., & Björklund, L. (2013). Exploratory talk in science education: Inquiry–based learning and communicative approach in primary school. Journal of Baltic Science Education, 12 (4), 482-496. Mercer, N., Dawes, L., Wegerif, R., & Sams, C. (2004). Reasoning as a scientist: Ways of helping children to use language to learn science. British Educational Research Journal, 30 (3), 367–385. Molinaria, L. & Mamelia, C. (2010). Classroom dialogic discourse. An observational study. Procedia Social and Behavional Sciences, 2, 3857-3860. Mortimer, E. F. & Scott, P. H. (2000). Analysing discourse in the science classroom. In J. Leach, R. Millar, & J. Osborne (Eds.). Improving science education: The contribution of research (pp. 126–142). Milton Keynes: Open University Press. Nystrand, M., Gamoran, A., Kachur, R., & Prendergast, C. (1997). Opening dialogue: Understanding the dynamics of language and learning in the English classroom. Columbia University, New York. Nystrand, M., Wu, L. L., Gamoran, A., Zeiser, S., & Long, D.A. (2003). Questions in time: Investigating in the structure and dynamics of unfolding classroom discourse. Discourse Processes, 35 (2), 135-198. Oliveira, A.W. (2009). Developing elementary teachers’ understandings of hedges and personal pronouns in inquiry-based science classroom discourse. Journal of Research in Science Education, 8, 247–269. Roth, W. M. (2005). Talking science. Language and learning in science classrooms. MD: Rowman and Littlefield, Lanham. Scott, P. & Ametller, J. (2007). Teaching science in a meaningful way: Striking a balance between ‘opening up’ and ‘closing down’ classroom talk. School Science Review, 88 (324), 77–83. Scott, P., Ametller, J. Dawes, L., Staarman, K. J., & Mercer, N. (2007). An investigation of dialogic teaching in science classrooms. Paper presented at NARST: New Orleans, April. Scott. P. H, Mortimer, E. F. & Aguiar. O. G. (2006). The tension between authoritative and dialogic discourse: A fundamental characteristic of meaning making interactions in high school science lessons. Science Education, 90, 605–631. Scott. P. H. (2009). “Inquiry good…traditional bad? Approaches to teaching scientific conceptual knowledge”. http://slideplayer.com/slide/4523182/. van Zee, E. H. & Minstrell, J. (1997). Using questioning to guide student thinking. The Journal of the Learning Sciences, 6 (2), 229-271.
van Zee, E. H., Iwasyk, M., Kurose, A., Simpson, D., & Wild, J. (2001). Student and teacher questioning during conversations about science. Journal of Research in Science Teaching, 38, 159–190.